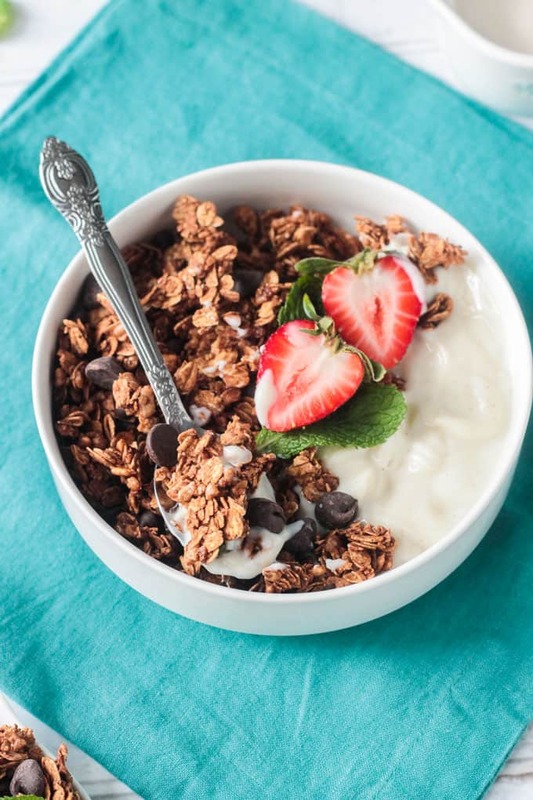 Mint Chocolate Chip Granola – healthy homemade granola with hints of vanilla and mint and studded with dairy free chocolate chips. With big crunchy clusters this gluten free and oil free granola is approved by adults and kids alike! 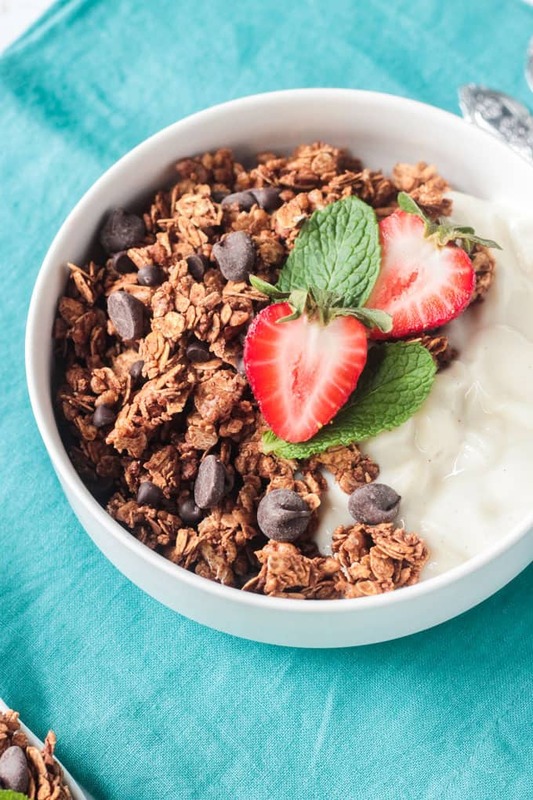 This healthy homemade granola recipe is the ultimate in crunchiness. No fruit, no nuts, no seeds – just super crispy crunchy whole grain oats and brown rice cereal tossed with a bit of unrefined sweetener and flavorings. Oh, and some chocolate chips because, well, chocolate! This recipe makes perfect granola clumps, but it’s easy to make looser, too, if you desire. Simple ingredients, easy instructions, suburb texture and flavor! Store bought granola is delicious, but it usually contains more oil and refined sugars than are necessary. You’ll also sometimes find preservatives and other questionable ingredients in the store bought kind. You can find some healthier store bought versions – I like the Purely Elizabeth varieties – but they’re expensive. It’s much cheaper to make your own at home. 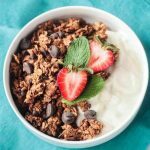 And it’s incredibly easy to make crunchy, healthy homemade granola that is oil free, gluten free, nut free, and refined sugar free. And it’s so tasty, you won’t be able to stop munching away. This homemade granola recipe needs just 8 ingredients, most of which you probably have in your pantry right now. It will take you less than 10 minutes to combine these ingredients and 30 minutes of hands-off oven time to make the magic happen. Combine the base dry ingredients – oats, crispy brown rice cereal, cocoa powder, and salt. Whisk the wet ingredients – pure maple syrup, vanilla extract, and mint extract. Pour the wet over the dry and stir until well moistened. Pour onto a baking sheet and bake until crispy. Try not to burn your fingers as you sneak a crispy crunchy bite off of the hot pan straight from the oven. Once cool, stir in the chocolate chips. There is a time and place for loose granola, but I prefer my granola with big crunchy clusters. It’s easier for the kids to snack on, too – no spoons needed. The key to getting those nice big chunks is to just leave it alone while baking. Sounds easy, right? It is! Just pack it down in one even layer on your baking sheet with no spaces in between. And then bake it – no stirring halfway through (though I do like to turn my pan around halfway since my oven tends to have some hot spots). Once it’s mostly cooled, break up the big rectangle into whatever size chunks your heart desires. They will undoubtedly break up a bit more as you handle it and transfer it to a container for storage, but you’ll definitely get some nice big crispy crunchy bite size chunks. 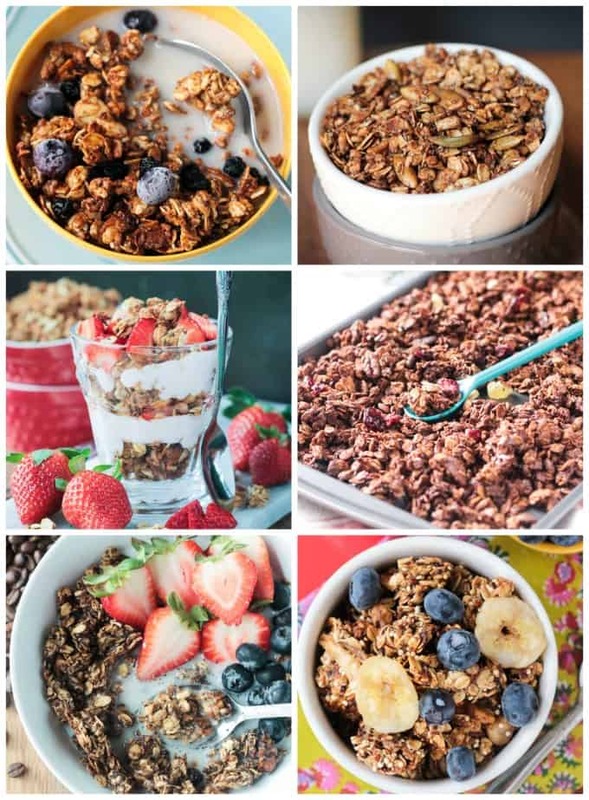 This seems pretty obvious, but granola is such a versatile food. Granola for breakfast is a staple. We like to pair our homemade granola with yogurt or a splash of rice milk and almost always with fresh fruit. Granola with chocolate chips, like this Mint Chocolate Chip version, is a go-to. You can, of course, add chocolate chips just before serving even if your original recipe didn’t call for them (or add more even if it did!). 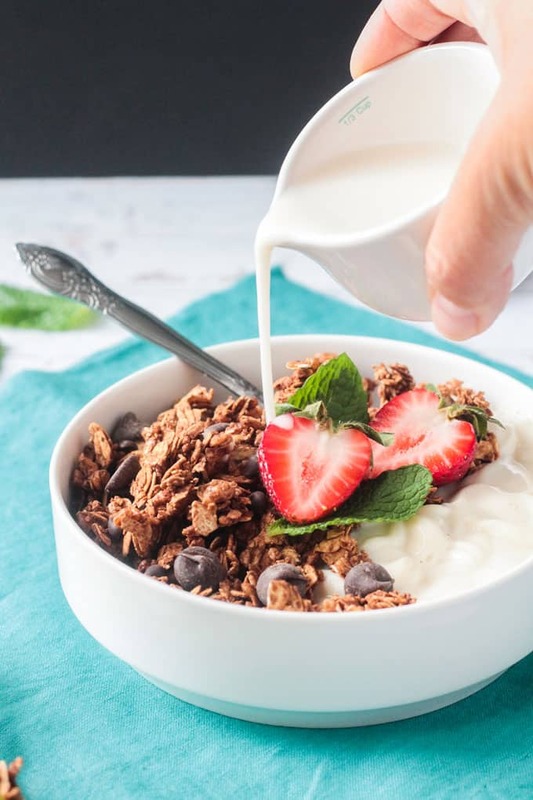 If you made your granola without nuts, you could always add some just before serving, which is a great way to get some healthy plant protein with on-the-go snacking. We LOVE granola in this house and I almost always have a big jarful on the counter. Here are some of our other favorites that you’ll find on the blog. All of them are gluten fee and oil free and I’ve noted below which are also nut free. 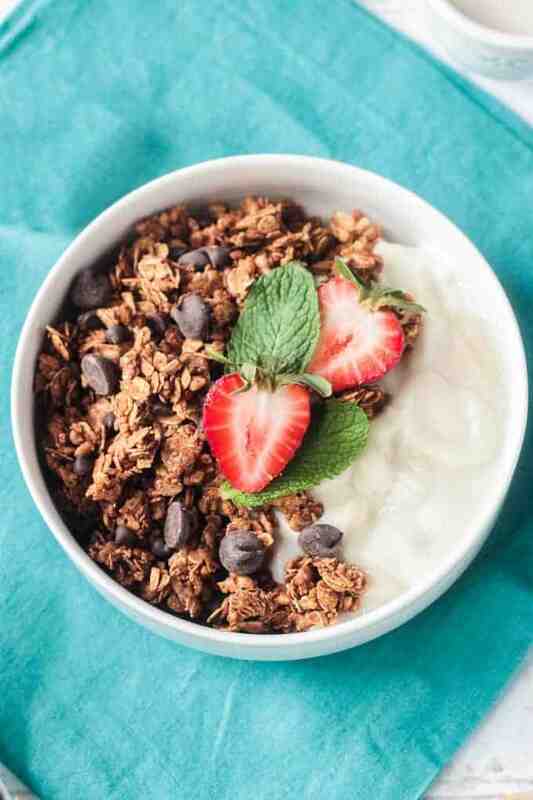 This Mint Chocolate Chip Granola is in the running for our #1 favorite. I have to say the Coffee Granola is probably tops for me, but the kids would claim this one as their new fave. You’ll have to them all and let us know which one you like best! 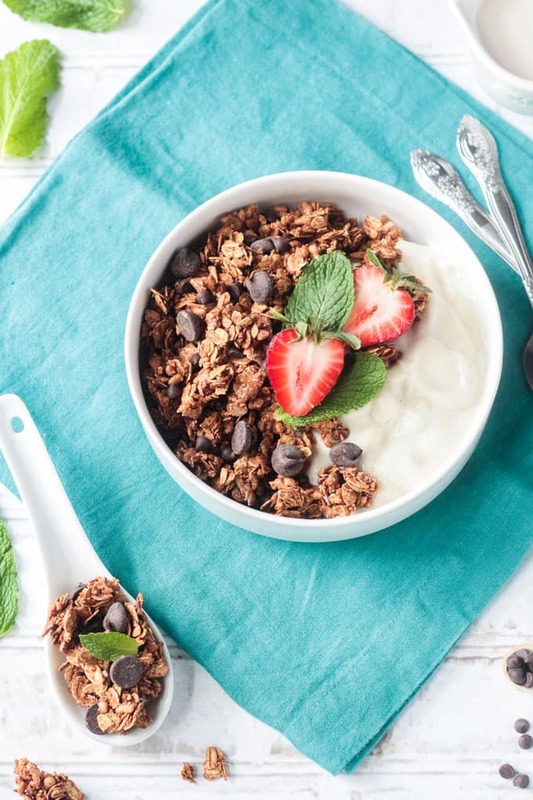 I hope you love this Mint Chip Healthy Homemade Granola Recipe as much as we do! If you try it, please come back and leave me a comment below with your feedback and star rating. You can also find me on social media. Be sure to tag @veggie_inspired and #veggieinspired so I’m sure to see it. Enjoy! 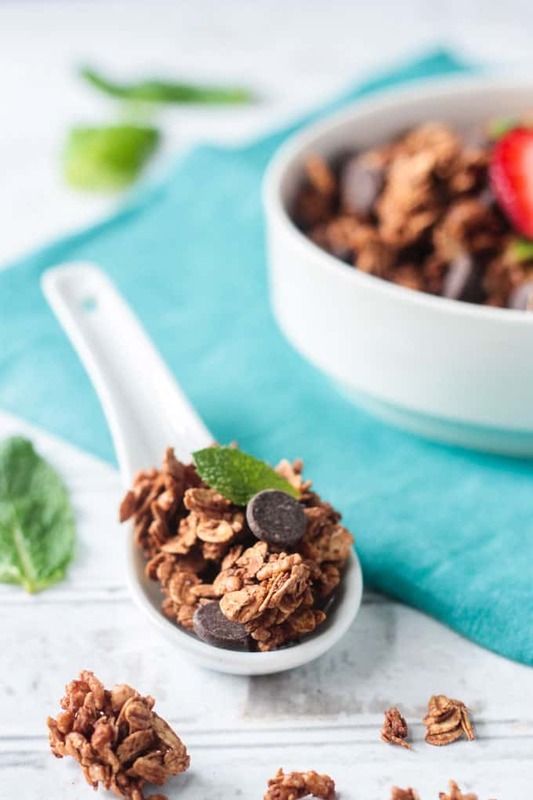 Mint Chocolate Chip Granola - healthy homemade granola with hints of vanilla and mint and studded with dairy free chocolate chips. With big crunchy clusters this gluten free and oil free granola is approved by adults and kids alike! In a large mixing bowl, stir together the oats, brown rice cereal, cocoa powder, and salt. In a small measuring cup, whisk together the maple syrup, vanilla, and mint extract. Pour the wet ingredients into the dry and stir really well, scraping the bottom of the bowl, to make sure everything is well moistened. 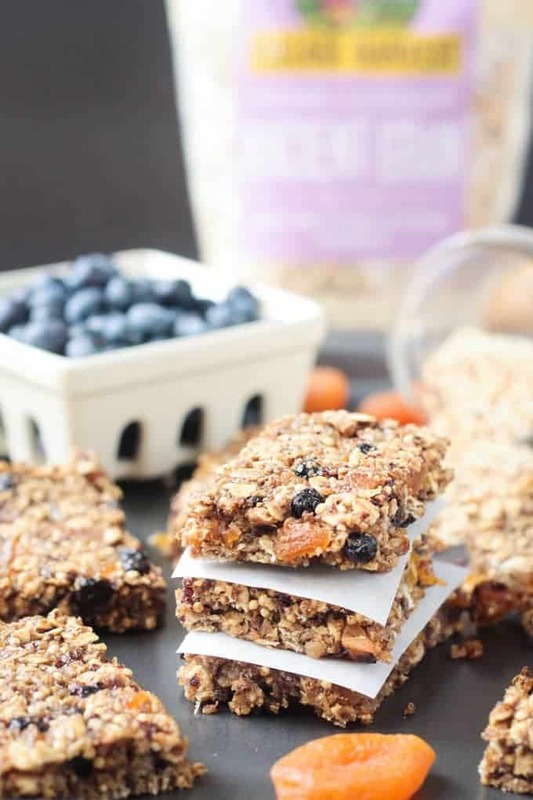 Pour the granola onto a large rimmed baking sheet into one compact even layer. Pat it down, but don't spread it out too much - you don't want gaps in between. Let it cool on the pan for about 10 minutes and then break into clumps. Add the chocolate chips and gently stir to distribute them throughout. Store any leftovers, completely cooled, in an air-tight glass jar on the counter. It will keep for 3-5 days, although it never lasts that long in our house! *If you prefer a looser granola with no big chunks, spread it out more on the pan and stir the granola bout every 10 minutes while baking. Yumm I love mint chocolate! Never thought to use it with granola though I have made a bowl of oatmeal like this. Oatmeal sounds like a fab idea too! Thanks, Ashley! 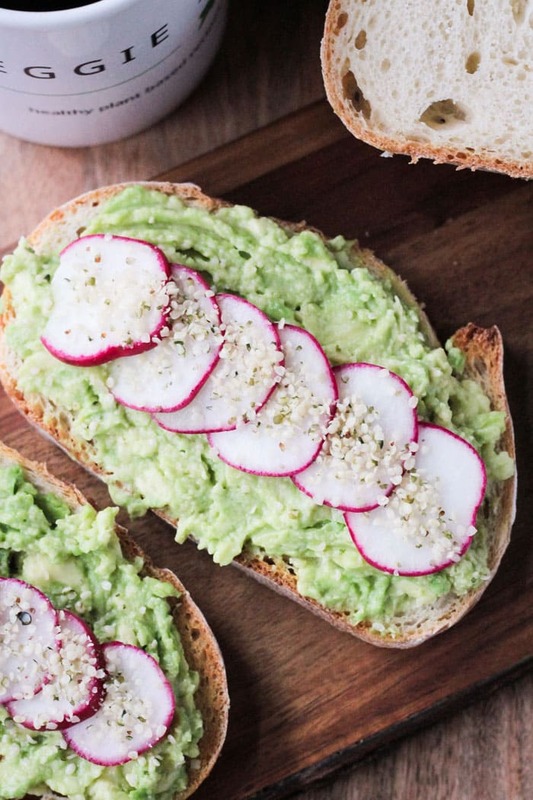 I love this for a snack option! I really love that you added some mint in there! I’m thinking my kids will love this and I love the fact I know exactly what’s in what they are eating as well. These days you can’t be too sure of the store brand mixtures. Exactly! Even the “healthy” brands can have some strange ingredients! I love making homemade granola. It is one of my family’s favorites. Especially ones with chocolate like this. Can’t wait to try it! I love making my own granola, and I make it fairly often. I’ve never thought of making mint chip flavor, which is funny because that’s like my favorite flavor combination (regardless of the time of year. I totally have to try your recipe; it looks super yum! Pinning for later. I’m not even a big mint lover, but paired with chocolate – it’s the only way! 🙂 Thanks, Debi! I feel like I always use coconut oil when I make granola or granola bars. I love that this recipe doesn’t use any oil at all! I love the big crunchy clusters of this recipe! I am totally making this for my son. He will love it! Thanks, Beth! It’s been a huge hit with all three of my kiddos. I hope your son loves it too!